My one daughter was a bunny, so it was fitting to make her twin sister a carrot! 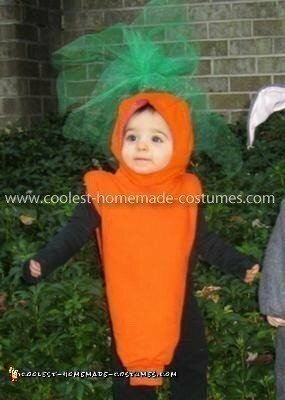 For this carrot costume, I got a 3T orange sweatshirt at a second-hand shop. My mother and I cut the stomach and back off of the sweatshirt and turned the cut edges under to make it neat. We sewed the wrist parts of the sweatshirt together at the bottom of the carrot and stuffed the sleeves of the sweatshirt with polyfill. For the hat, we created a cap out of the orange material that was left over from the stomach and back of the sweatshirt so that it was the same color as the carrot. We used velcro under her chin to keep the cap on. I took a piece of foam and formed it into a triangular/cone shape, about the size of an ice cream cone and covered it in green tulle. I brought the tulle up around the cone and tied the top with green thread to gather it together. We hand-stitched the green cone to the top of the orange cap to create a dramatic top!